It is hardly surprising that the hot summer experienced in many parts of Australia has led our very own warmists to claim it confirmed the dangerous global warming threat of rising temperatures. While this claim has been widely reported in the media, including the ABC and The New York Times, as if it is factually correct, in reality the warmists have a problem. 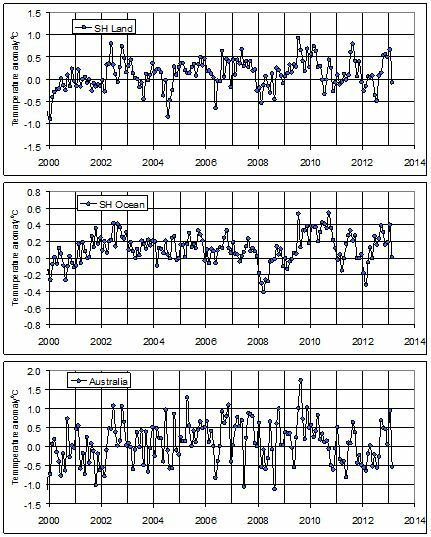 Analysis using data from satellite measurements and from the Australian Bureau of Meteorology (see below) by physicist Dr Tom Quirk of the actual movement in temperatures indicates that there was a small fall in February in the global average temperature. 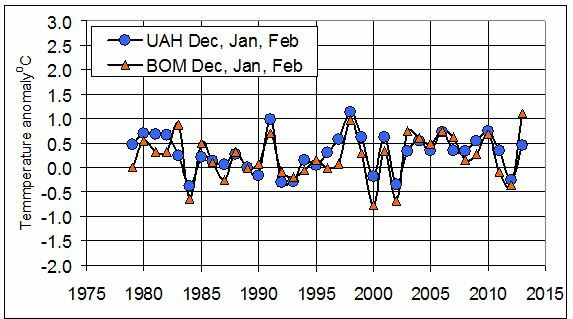 Both these sources also show falls in February in the average for the Southern Hemisphere land and ocean and for Australia (satellite data below from John Christy, University of Alabama at Huntsville). True, in the summer months of December-February there was an increase in the average for Australia. But as graph immediately below shows, similar increases have also occurred in other summers over the past 30 or so years. Dr Quirk notes that the graphs show that it remains unequivocal that there has been no substantive change in annual global average temperatures between 2002 and 2012. And while there has also been no change worth noting in the 16 years from 1998, account needs to be taken of the fact that this pause includes the “high” El Nino affected year in 1998. Yet according to the head of the government’s Climate Commission, Professor Tim Flannery, “if you look at the whole Earth system, you can see that strong warming trend. And indeed, if you look at the atmospheric record for a long enough period, you see exactly the same trend”. In response to the interviewer’s observation that “figures released last year… showed that there’d been a plateau for about the last 15 years or so”, Flannery replied “in a sense what you’re saying is correct …but there has been no plateau!" (below). By contrast, former Deputy Head of the Bureau of Meteorology, Bill Kininmonth, has noted that “the high temperatures were neither Australia-wide nor global, as might be expected from carbon dioxide forcing… (and) the past summer was only 0.2 degrees warmer than the previous warmest summer of 1982-83”. Separately, Kininmonth has observed that the trend in the Australia-wide maximum since 1980, including this recent “hottest summer”, has been 0.1 degrees per century, not significantly different from zero. He compares our hot summer with that experienced in Europe in 2003 — a manifestation of a sustained blocking weather pattern. Here we have a classic example of the acceptance without serious checking of analyses by “official” scientists who are prepared to use data for their own purposes. 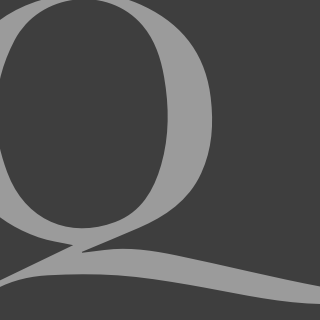 It further reduces the credibility of the Gillard government’s policy on climate change. It is also a disgrace that the ABC did not have an alternative view when Flannery was given an extensive interview on 7.30. As Andrew Bolt suggested in his Sunday TV program (below), Flannery and the Commission should cease to have an official role.